TOY for Inclusion Toolkit: A step-by-step guide to creating inclusive Early Childhood Education and Care (ECEC) Play Hubs for all generations provides all the necessary conceptual and practical information to enable trainers and practitioners from different sectors to set-up and run non-segregated multigenerational play spaces. The toolkit pays particular attention to social integration, intercultural and intergenerational dialogue, and social inclusion in the context of early childhood education and care (ECEC). The following topics are addressed: Setting the vision for all the children in the local community; The importance of community-based ECEC and integration of services for inclusion, equity and respect for diversity; Play spaces as community resource hubs; All generations learning and playing together (intergenerational learning); The importance of desegregated ECEC for Roma and non-Roma children, and Anti-bias education and Quality in community-based ECEC projects. 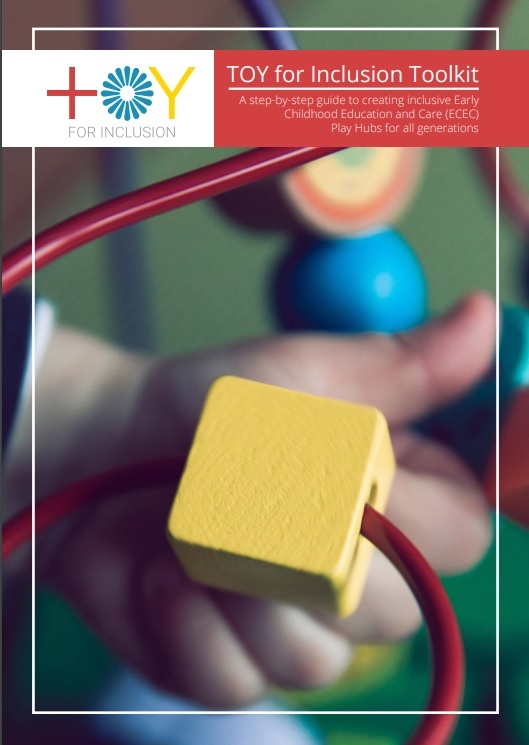 The TOY for Inclusion partners are available to provide guidance and training, in case your organization is interested in setting up an ECEC Play Hub. The training materials (PowerPoints) mentioned in the Toolkit are available upon request.